Pipe Dream asks: Who is Harpur’s Ferry? When P.J. Germano packs his bag for class, he makes sure he has his notebook, pens and a two-way radio to respond to calls for emergency medical help. He carries a radio because he’s a member of Harpur’s Ferry, Binghamton University’s student-run emergency medical service, and every one of the group’s 150 student volunteers has one 24 hours a day, seven days a week. To date, they’ve received around 550 calls this year and expect to hit 800 by year’s end. 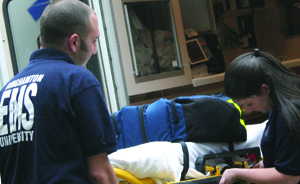 Comparatively, the Binghamton Fire Department’s EMTs receive over 1,000 calls per year. From dislocated fingers to heart attacks, from floods to baseball games, from a possible biochemical threat to mosh pits at Events Center concerts, Harpur’s Ferry is the primary emergency response team on campus and has been since 1973. That’s right — they don’t just respond to drunk BU students. In fact, the majority of the calls “the Ferry” receives are for sports-related injuries, said Paul Meddaugh, a Ferry veteran and the service’s equipment coordinator. Some calls are unique, like when crews responded to a student who attempted suicide by jumping from the 15th floor of the Glenn G. Bartle Library Tower or when crews have to transport a passenger in handcuffs with a University Police officer in the back of the rig (EMT-speak for “ambulance”). Many of the volunteers talk about “a rush,” a surge of adrenaline that strikes when a call comes in. “It doesn’t matter how long you go out,” Meddaugh said — the surge always comes. A handful of volunteers always stands ready at the squad, the group’s headquarters in the basement of Health Services. They work in shifts: three-hour bursts during the day and a six-hour overnight shift. Binghamton’s New York State University Police department is their dispatch agency — though occasionally Broome County dispatch will call them. The table in the group’s basement headquarters in the Health Services building is strewn with textbooks as members scramble to balance being on call with being full-time students. When Germano shows up at the squad room he checks over the ambulances. Then “[I do] some studying, surf the net and just wait for the toner to go off,” he said. Clearly, this isn’t your average job at the local mall. That fleet and the people who man it subsist on a budget of roughly $100,000 a year, according to Ferry Financial Coordinator Jessica Martinez. Approximately $52,000 goes to equipment and medical supplies, while the rest is for personnel necessities like training, office supplies and uniforms. But Harpur’s Ferry does not bill its patients — in fact, it’s the only service in the county that doesn’t — so it gets its funding primarily from its share of the Student Activity Fee that Bearcats pay the Student Association each semester. Funding also comes from donations from parents and alumni and fund raisers, like the Ferry’s annual Valentine’s Day rose sale. Members maintain that Harpur’s Ferry is one of only eight collegiate ambulance corps in the nation to have Advanced Life Support capabilities. Last year, Harpur’s Ferry was recognized as the best collegiate EMS organization in the nation, as well as the best EMS agency — collegiate or not — in New York State. Trophies, like the “Outstanding Community Service Business Organization 2004 XCELsior Award,” line the shelves and floor of the basement headquarters; the Gator earned Harpur’s Ferry a four-foot-high “Judge’s Special Recognition” trophy from the annual Sullivan County Volunteer Firemen’s Association parade in Rock Hill, N.Y.
Harpur’s Ferry is comprised of 150 student volunteers with majors ranging from sociology to geography to psychobiology. Many will go on to become doctors, nurses, physician’s assistants or medics; some have gone on to practice law or pursued other non-medical careers. While some members are new to medical services, others have been doing it for years. Jacqueline Brass is the Ferry’s first assistant chief and is a senior in Decker School of Nursing. She’s been involved in emergency medical care since she was 16. Brass’s participation in Harpur’s Ferry and in Decker have worked well with each other. On the wall of the basement office are framed papers and bandages. One of the papers is the EMT oath. “Be it pledged as an Emergency Medical Technician … I will follow that regimen which, according to my ability and judgment, I consider for the benefit of patients and abstain from whatever is deleterious and mischievous … Into whatever homes I enter, I will go into them for the benefit of only the sick and injured, never revealing what I see or hear in the lives of men unless required by law,” it reads. There’s more, but that’s the heart of it. The 4-inch by 4-inch framed bandages, meanwhile, are signed by celebrities who have performed at BU. Harpur’s Ferry sets up a standby incident command post at every performance. Steven Lynch signed one bandage. Incubus signed another. Famous musicians notwithstanding, for members like Handshaw, the day-to-day joys of being in Harpur’s Ferry run a bit deeper.